What separates a good sushi bar from a great sushi bar? Attention to detail and fresh fish are the basic requirements; craftsmanship and technical skill, too, is paramount. We find that our favourites tend to be the smaller, more intimate settings where diners can freely interact with the itamae in front of them, where every meal is an adventure via the free-form menu that is omakase (“chef’s choice”). Find a good sushi bar and you’ll eat well for an evening – find a great sushi bar, make friends with the chef, and you’ll eat well for life. 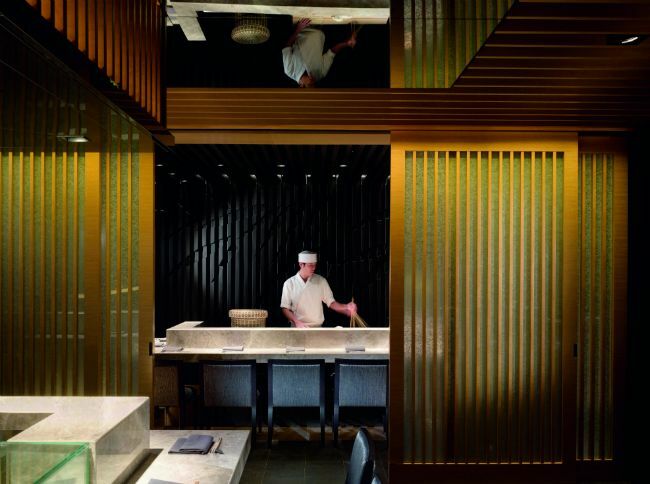 This relatively hidden sushi bar is housed in the glossy Cubus building in Causeway Bay and, instead of woods and traditional fabrics, Sushi Ta-ke uses marble for a contemporary look. We recommend you take a seat at the sushi counter to order omakase – the friendly, chatty sushi chefs here cherry pick the best fish and seafood on offer and will take into account your own personal preferences as well. We’ve always been pleased by the ability of the chefs here to remember said preferences on our return visits. Some stunning highlights from a recent meal included an unusual seared flounder tip nigiri, served with its oils dripping over the sushi rice. Opened in 1998, Sushi Kenjo has two locations in Tsim Sha Tsui – one on Hart Avenue and another on Minden Avenue – but we prefer the original on Minden, as that is where sushi master Kenjo-san can usually be found. The dinner omakase (about HK$1,000 and up) is naturally impressive, but it is the lunch sushi gozen set that represents the best value for money. What we love most about Kenjo is its consistency – the beautifully fresh and varied sushi set always features rice that is appropriately vinegared and sticky – as well as the other accoutrements. We challenge you to find a better chawamushi in town. This newcomer has already launched itself into our top five despite having only opened this past September. The first branch of the acclaimed sushi bar of the same name in Ginza, Tokyo, Sushi Yoshitake is a prime example of utmost dedication. The eponymous chef Masahiro Yoshitake, along with his English-speaking sous chef Yoshiharu Kakinuma, work in an utterly sparse eight-seater bar in the Mercer Hotel in Sheung Wan, making magical morsels out of seasonal fish such as golden-eye snapper and Japanese imperial prawn. Unlike other sushi bars, chef Yoshitake uses aged red vinegar in his shari (sushi rice) which imparts a light auburn hue and elegant tart flavour. In 2009, Sushi Shin opened to great fanfare in Tai Hang. Their claim to fame? It was opened by three apprentices of Kenjo-san. Both restaurants share the same minimalist approach to décor, with light wood and white being the dominant themes. The menu and quality of fish is similar to the one at Kenjo: so has the student outshone the master? Not quite. Although we certainly like Sushi Shin, they do have a tendency of running out of fish by 1pm, something that had never happened to us once at Kenjo. However, their sushi is the reason for going, and what they do have available, are always fresh and expertly sliced and shaped, and also good value if going at lunch. One of the few excellent sushi bars in Central, we’ve been impressed with Sushi Sase since it opened in 2010, and its top-notch sushi (an example is pictured above) is a testament to its enduring appeal. The tranquil space, which houses an 18-seater sushi bar, is a fitting backdrop for a parade of intricately crafted sushi and sashimi made using the freshest fish and carefully selected garnishes. The sushi chefs here are attuned to seasoning the fish just right, making soy sauce redundant; complementary garnishes are used to bring out the best of each fish, for example citrus zest over oily fish, or shaved rock salt. Want to learn how to make soft shell crab maki rolls? Watch our Epicurean Express video.